Streamlined Size: The machine measures approximately 10 x 11 x 12 inches & 8 lbs. Patented Dual Function Filter Holder: Use convenient pods or ground coffee for simple and fast espresso preparation. 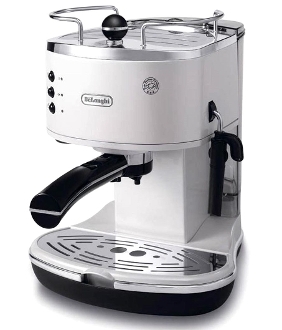 Patented Cappuccino System Frother: Easily prepares lattes and cappuccinos, mixing steam and milk to create a rich, creamy froth for perfect drinks every time. Self-Priming Operation: Eliminate annoying start-up preparation. Built-In Tamper: Takes the guesswork out of tamping and extracts the best flavor every time. Removable Water Tank (48 oz): Easy to clean with indicator light and removable drip tray. Indicator Light: Enjoy the easy operation of the on/off switch.